Hairstylist shares a laugh with a mentee. RUTLAND — Adult-to-youth mentoring is one of the best ways to bring about changes in a young person’s behavior, attitudes, health, and academic performance. 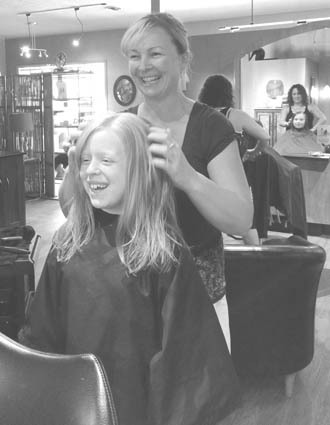 To celebrate mentoring within Rutland County, Five Elements Salon and Day Spa joined with the local mentoring organization The Mentor Connector to provide a Mentor/Mentee Spa Day on June 14. The Five Elements staff donated their time, talent, and tips to mentors and mentees for the afternoon. In total, 28 participants chose from manicures, massages, and haircuts as they were treated to an afternoon of beauty and therapeutic services. Five Elements Salon and Day Spa is a full service salon and day spa. For more information visit www.fiveelementsdayspa.com. For more information or to become a mentor call (802) 775-3434 or visit www.mentorconnector.com.